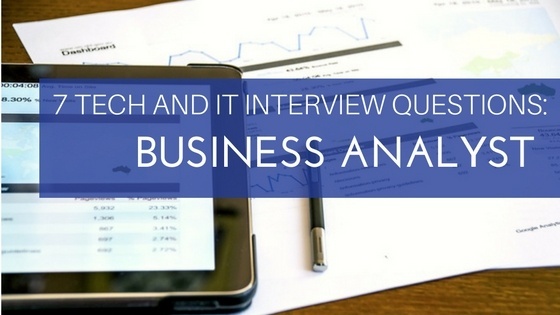 What is an IT Business Analyst? An IT business analyst examines the technology, information, or systems needs of an organization to achieve its goals. Business analysts define requirements, research solutions providers or develop internal programs/processes, and present those solutions to key stakeholder to solve the company’s information challenges and problems. Do you have formal business analysis training or certifications? Have you done a gap analysis? Have you lead joint application design(JAD) sessions or conducted them in conjunction with a Project Manager? What is your experience in writing technology use cases? Have you written documents defining functional requirements and to what depth? What tools have you used to create requirement documentation? Are you comfortable communicating needs and requirements between business leaders, solutions providers, and/or development teams? These questions can be a great starting point for assessing general business analysis skills and experience. Augmenting this list with questions specific to your company’s needs – like what tools they are proficient in or industry related topics - will help you find a business analyst that will help your organization reach its goals. Do you need to add a business analyst to your team? Advanced Resources’ Technology Division can connect you with experienced and in-demand business analysis talent. Learn more here.